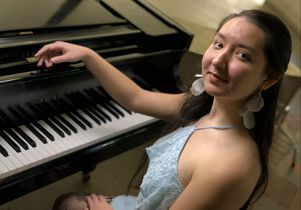 Ever since Alethea Sung-Miller found a piano to play on a patio near her UCLA dorm room, people have been approaching her. There was the woman who requested she play an encore of a Prokofiev piece, the Swiss documentary crew who asked to film her for their project, and even the boy who asked her out on a date after hearing her play. Passersby might hear the sophomore playing “City of Stars” from the movie “La La Land,” or Debussy’s “Clair de Lune” as they pass her outside of Covel Commons, but just as often they’ll hear her playing one of her own classically inspired compositions. But what surprises the people who strike up a conversation with her isn’t just that she composed the music herself. Although the impromptu conversations start with her passion for music, they frequently veer into Sung-Miller’s passion for electrical engineering or one of her many other interests, like novel writing, hardware hackathons, film scoring, coding theory, ballet or nanorobotics. Serendipitous meetings like that are exactly why UCLA has not one, but four outdoor pianos available to anyone on campus. 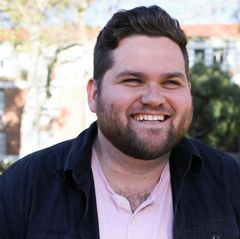 Jeremy Barrett, a fourth-year UCLA economics major, started the Piano Project with three pianos in the fall, and the fourth arrived with fanfare in January. With $2,500 from the UCLA Semel Healthy Campus Initiative Center, pianos donated by the UCLA Herb Alpert School of Music, and additional support from Chancellor Gene Block, UCLA Housing and several others, Barrett placed pianos that anyone can use outside Covel, Bruin Plate dining hall, Luskin Conference Center, and on Bruin Walk, the central walkway through campus. “I wanted to do one small thing to help students connect,” said Barrett, who has played piano since he was 6 years old. His heart is “100 percent music,” but it’s challenging for non-music majors to find an instrument on campus, he said. He and his campus partners are changing that. “We envision a space where our diverse student body will congregate, break down barriers and generally use the apolitical, universal language of music to talk to each other, build friendships and make a better place,” Barrett said. With students like Sung-Miller regularly tickling the ivories and making new friends as a result, Barrett’s dream is a reality. 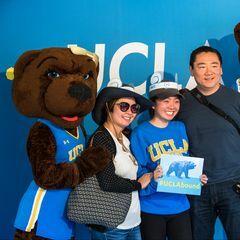 Peter Angelis, the assistant vice chancellor of UCLA Housing and Hospitality, wondered how the students who live on the Hill had gone so long without instruments. For Sung-Miller, the piano is “a home away from home.” She stumbled onto it when she heard someone else playing, and it was weeks after she found the piano that she learned about the Piano Project. Music is a respite that distracts her from chronic migraines, but she also keeps busy with piano lessons from UCLA faculty, an internship with the composer from the show “How I Met Your Mother,” and building a drone with a team of students from UCLA’s Institute of Electrical and Electronics Engineers club. Alethea Sung-Miller, UCLA electrical engineering major who is also a composer.